Afternoons in Waikiki can be spent a number of wonderful ways. Cruising and sun baking on the beach, watching the day go by from your favorite spot at Duke's or aboard one of the colorful catamarans for a sail around the 96815 all sound a-ok to me. 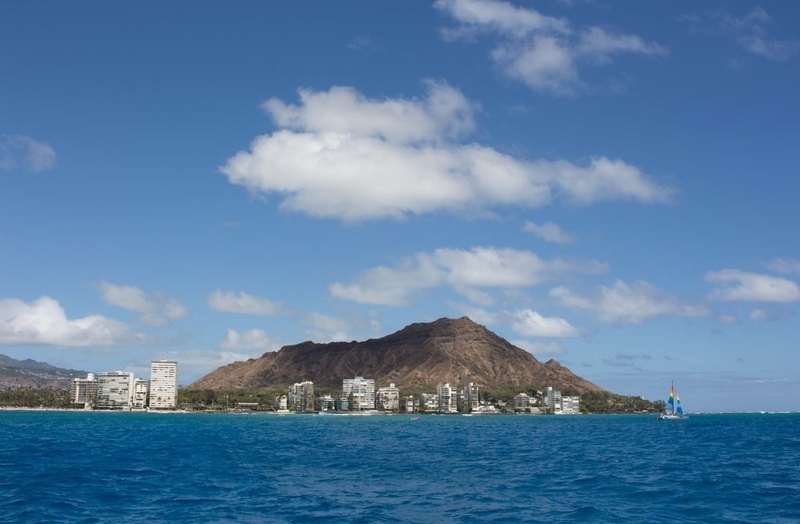 On this Sunday, we joined our friends on the Manu Kai, the yellow and blue cat that calls home to the curvaceous shoreline fronting the Outrigger Waikiki. Join them for one of their many sails which run throughout the day and into sunset. On the sail & swim, which departs at 1:30pm daily, we stopped for a quick 10 minute dip in the somewhat shallow, crystal clear waters just off Diamond Head. Back on board, it's all smiles and good times coasting over the waves and sharing a laugh with the new friends we've made while out at sea. Happy, sun-filled days like these won't soon be forgotten even when our polaroids begin to fade. Manu Kai Catamaran offers seven distinct sails daily as well as private charters. Check out their website or give them a call for more information! A few weeks ago, I had the pleasure of meeting a friend for lunch at the Sicilian restaurant, Taormina, in Waikiki. I arrived hungry and ready to chow down, so we went for a tasting of the chef's latest and greatest menu items. If you have been to Taormina, you know that it is a deliciously slow, fine dining experience. The pace is perfect for me. When things taste this good, I like to savor every last bite. At lunch, however, savoring time isn't always on the menu. I am generally not a lady who has time to lunch, so I was pleasantly surprised to find Taormina now offers a lunch menu that can be served up fast if you are short on time. Favorite dishes: Pork Milanese and the Seared Ahi salad. The rich, tasty balsamic vinegar tomato sauce served over a perfectly crisp pork cutlet is superb! The fresh seared Ahi salad is tasty, lighter fare and lovely to look at (while it lasts!). Taormina has perfected savory fine dining in a flash and I wouldn't expect anything less from Chef Hiro. A true craftsman, he travels to Italy a few times a year to study and to scout out new dishes to bring all the way back to the 96815. Any time of day, I say, "Bravo, Taormina!" The 96815 Tip! Taormina is offering 50% off the prix fixe lunch menu every Sunday through March from 11am to 3pm. Normally $42, enjoy a four course Sicilian style dining experience for $21! Free parking with validation at Wyndham and Embassy Suites during lunch, daily. Taormina, Sunday to Thursday 11am - 10pm, Friday & Saturday 11am - 11pm, ph. 808-926-50550, 227 Lewers Street, the 96815.